To the right is a 1972 aerial photograph sent to us by Captain Michael Pryce, who grew up in Heysham and after a mercantile career settled in New Zealand. 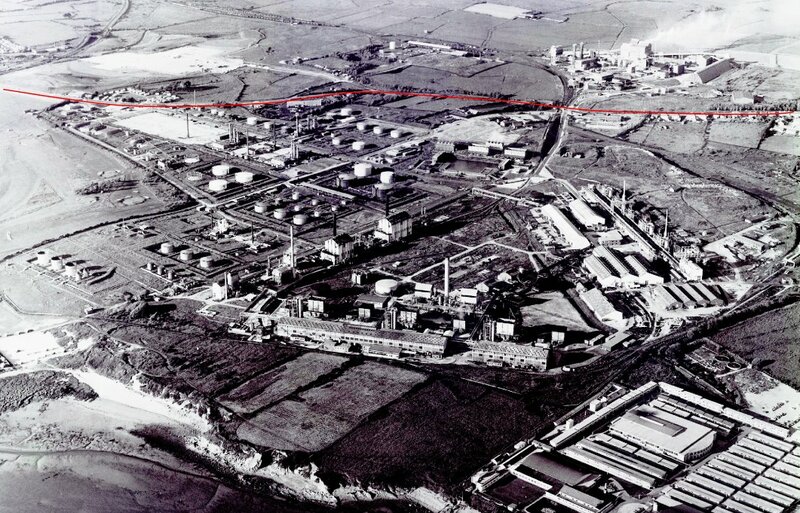 The picture shows the fulll extent of the refinery and to give some perspective the red line across the top of the picture indicates Middleton Road from Heysham to Middleton. The sea shore is at the bottom of the picture with Pontin/s holdiay camp bottom right. At the top right is the extension to the roiginal refinery to the east of Middleton Road.. The tfirst photograph below right is of that part.. 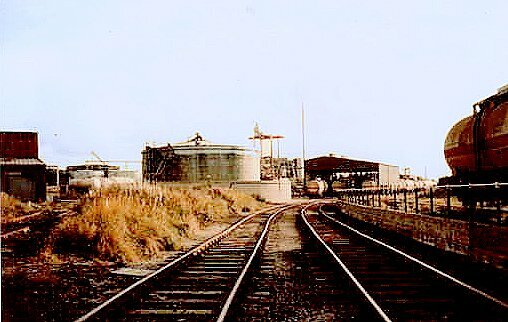 The site was set up in 1939 by the Air Ministry as the Heysham Aviation Fuel Works to supplement the North American supplies of aviation fuel for the RAF. Using coke brought in from the Durham coal field together with imported gas oil, which came by sea in tankers to a new deep water mooring to the north of Heysham Narbour. The mooring was connected to the north harbour wall by a long wooden jetty. and the oil brought on shore by a submerged pipeline and transmitted on to the new refinery.Information from a detailed paper on this Oil Jetty indicate that the first oil supplies were delivered in the late summer of 1941. ICI produced the base petrol and ammonia while Shell produced iso-octane to boost the base petrol from 87 octane to 100 octane standard. Shell had found that the use of tetraethyl lead and hydrogen as fuel additives made it possible to suppress engine knock and to boost aircraft engine performance. This process is well written up elsewhere; see in particular paragraph 1.1.6 of this link. See also a press release by the Royal Society Chemistry in 2009The refinery is also mentioned in detail by The Kings Own Regimental Museum (in the Lancaster City Museum) in a section about the Home Guard. Once the war had ended the refinery was inactive for a period. The Morecambe Town Council wanted it dismantled as it was considered unsuitable for a seaside resort. However in 1948 the Government sold it to a consortium of Trinidad Leasing, Imperial Chemical Industries (ICI) and Shell,shortend to the name ‘eTrimpell’f. Productiuon was transferred to explosives, nitric acid and fertiliser. In addition The Ministry of Supply funded a Nitric Acid and Ammonium Nitrate plant for explosive purposes which was also run by Trimpell. 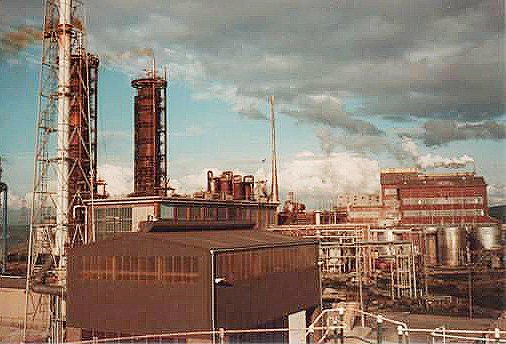 The use of the site as a chemical works then continued until 1986. The second of the two photos (rabove ight) is most likely now the road to Heysham Industrial Park, and no doubt visitors to that, or the United Utilities Treatment Works, or to the Nature Reserve or model boat sailors will recognise the picture. Trimpell gave employment to an estimated number of 2000 which halped the economy of the local area. In 1956 Trimpell opened a sports and social club in Morecambe for its employees, a club which still exists and is thriving and now owned by its members.. The Trimpell Club website has a short history section which provided some of the information relayed on this page. Similar information also appeared in the Visitor newspaper at the time. To the left is a 1983 aerial view of what is now Middleton Business Park. The older part of the refinery to the west of the road is fully off the picture. Middleton village is in the right foreground. In 1975 a firm called Solrec (solvent recovery) bought the nothern section of the refinery west of the Middleton Road. 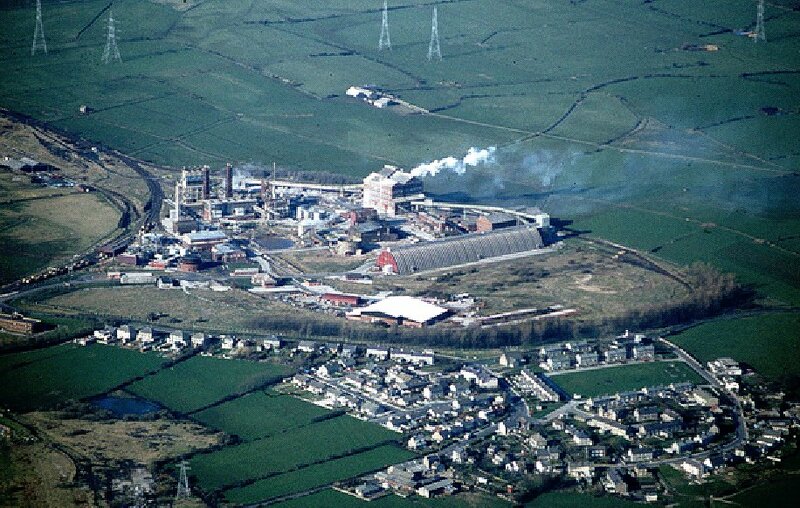 The southern part has become in part Heysham Business Park and later a new treatment works for United Utilities. The central area is a large nature reserve already known for a huge range of species including several species of orchid.. The nature reserve is under the management of the Wildlife Trust for Lancashire.. The nature reserve is on land now owned by Lancaster City Council (acquired c 1985). A recant City Council document gives a timeline for the whole refinery. This long hangar building, like a huge Nissen hut, was first drawn to oiur attention by a local correspondent some time ago. It is now part of Middleton Business Park. He surmised that it pre-existed the Trimpell refinery but for what purpose? .It also figures in the background of the engine picture below. The plant at Heysham, together with those at Stanlow and Billingham produced iso-octane additives required to raise 87 octane fuel to 100 octane rating. Initially, the limited size of the 100 octane fuel stockpile required strict rationing until supplies could be increased to meet requirements and the 100 octane fuel was dyed green to distinguish it from the 87 octane fuel which was blue. 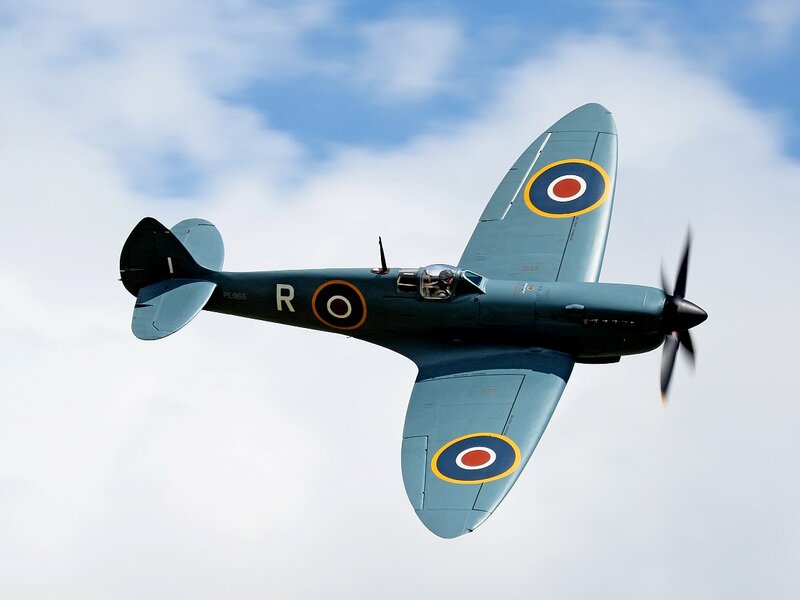 Bulk supply contracts for higher octane fuel were placed by the Air Ministry and it was put into widespread use in the RAF in March 1940 when Spitfires' Rolls Royce Merlin engines were converted to use the 100 octane fuel. By May 1940, reconnaissance Spitfires had begun flying combat missions using the 100 octane fuel. By 31 July 1940, there were 384 Spitfires serving in 19 squadrons using the 100 octane fuel. A German aerial reconnaissance photograph, dated October 1940 and marked 'only for internal use', showed the oil refinery with some areas of the plant such as the boiler house, storage tanks (including those under construction), and flat-roofed warehouses being labelled on the photograph. In March 2018 LuneTube published a video about this event, entitled Fuel for the Few, click here to watch it. Colin Hartley has drawn our attention to this unusual shunting engine at Trimpell in the mid 20th century. It has no funnel at the front. 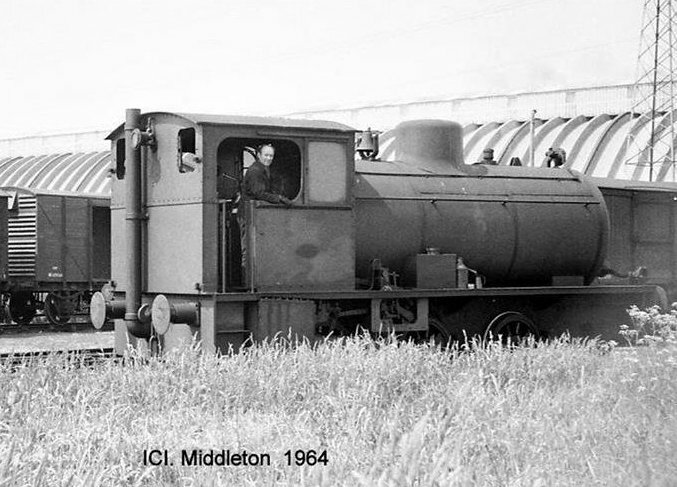 The photo was posted recently on the All About Middleton Facebook page by Trevor Norris. It appears to be that it is one of of only 14 ‘fireless’ engines built by Bagnalls of Stafford and it still exists in a restored state in Shrophire. Click here for more info (scroll down to 3019). Note the long hangar building in the background which appears in the picture at the top right of this page..